I’m completely stoked to participate in the December Smart Set 1 piece, 10 styles project as their guest of honour! 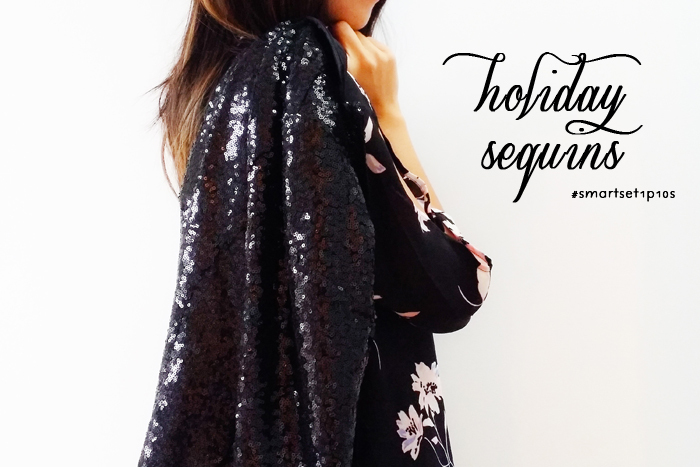 I’m so thrilled to work alongside 10 other fashionable ladies to style this month’s feature item – The Sequin Blazer. Don’t be intimidated by all the bling on this blazer! It is such a versatile piece to have in your closet during the holiday season. It can definitely bring you from the office to your holiday parties. This sequin blazer can easily be layered over your office attire to add instant glam or thrown over top a crisp white button down and a pair of denim. The possibilities are endless! 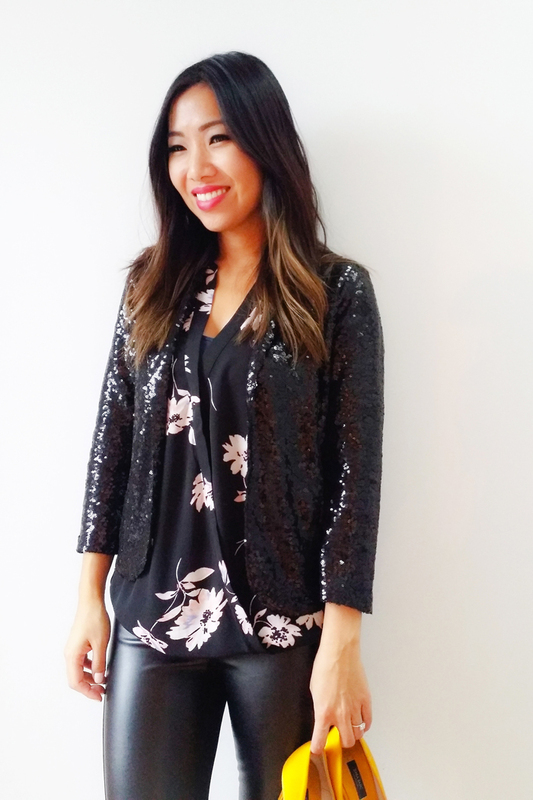 I am wearing the sequin blazer in a XS layered over top a floral chiffon wrap blouse and an edgy pair of faux leather pants. I love combining a mix of materials to give any outfit an unique personality! 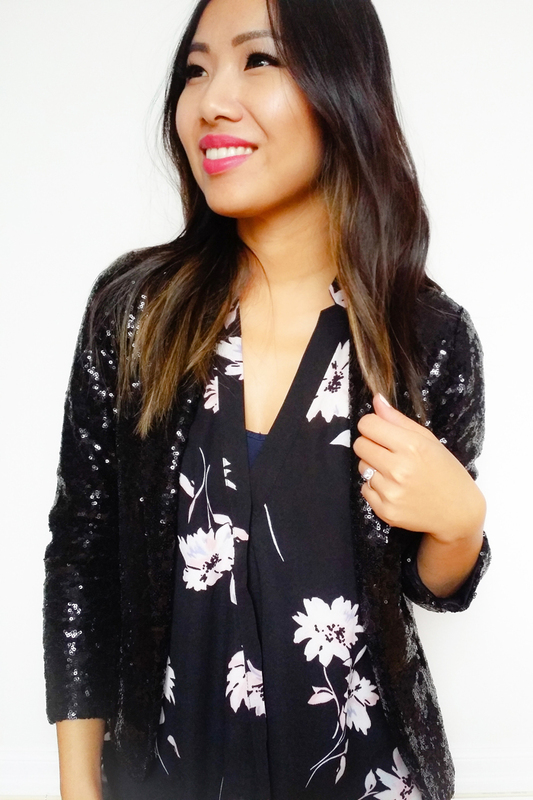 Read further to see how the other 10 Canadian Smart Set Ambassadors have styled this sequin blazer! There’s ought to be one that tickles your fancy! During my recent trip to Smart Set, I was impressed by the array of functional yet trendy items in stock (not to mention an awesome price tag). I’m also quite pleased to see the sizing is in full range from XXS to XL – which accommodates the petites and curves! Although Smart Set has recently announced the close of their stores across Canada, you still have a chance to pick up some great finds for a few more months! Here is a round-up of the other 10 styles from these beauties across Canada! Enjoy and Happy Holiday Shopping! Great look! I’m digging the sequined blazer. I’m going to have to pick one up!